Each year, the calendar of events in Mobile and surrounding areas is filled with community celebrations, arts festivals and seasonal gatherings. Here are just a few of the more popular annual events along the Gulf Coast of Alabama. Every March, individuals from around the nation gather in Mobile for the annual BBQ Championship & Hog Wild Festival. 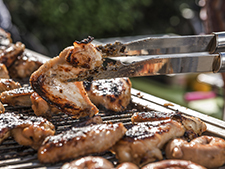 Talented chefs can take part in the backyard BBQ competition, serving up savory plates of chicken and ribs. Competing teams also vie for the distinctions of best sauce, best seafood dish and best dessert. The fun doesn't stop there - visitors can enter pig races and enjoy cooking demonstrations at the Hog Wild Festival. The Festival also includes games, science exhibits, a rock-climbing wall, pony rides, and live music. No matter where your interests lie, all festival-goers can find great entertainment. A celebration of the world's many cultures, the Mobile International Festival gives are residents the chance to explore the customs, history and cuisine of far off-nations, all under one roof at the Mobile Civic Center. Held over three days in November, the festival includes art and craft from around the globe. Performances include music, dance, puppetry and acrobatics from a diverse array of cultures. Of course, the festival also includes plenty of world food to delight the appetites of visitors. In fall the small coastal community of Gulf Shores welcomes over 200,000 visitors to the Shrimp Festival, a four day celebration of the Gulf's most delicious resident. Not surprisingly, visitors can indulge on almost every kind of shrimp recipe imaginable. In addition, the festival is stocked with plenty of other great seafood choices as well as festival favorites like funnel cakes and kettle corn. Bands play on two separate stages throughout the day and on into the evening, art is displayed by both regional and national artists. A special Children's Village has plenty of games and activities for the little ones. One of the most popular events at the festival (after a good shrimp meal) is the sand castle competition, which is open to both children and adults. In the heart of summer, the skies above Baldwin County fill with the lazy outlines of some 40 hot air balloons soaring in a mile-high flotilla. The South Baldwin Chamber of Commerce hosts this three-day event in mid-July. Lift high above the ground in one of these magnificent flying objects. For those who feel uncomfortable with the idea of floating away, tethered rides provide a nice alternative. At night the balloons line up on the launch field with their balloons re-inflated. The pilots then ignite their propane burners and the balloons light up with a firefly-like glow that is enchanting.